This work also originated in a Yahoo discussion group, in this case a Great Northern list. 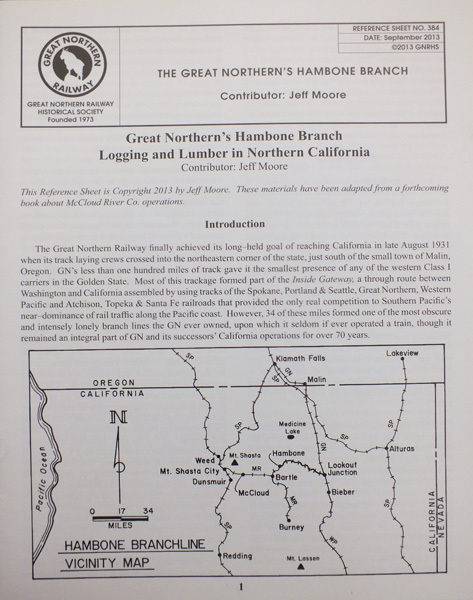 The subject came up of GN's footprint in California, and the reply I posted sparked a discussion with the Great Northern Railway Historical Society, which quickly turned into this 32-page Reference Sheet on the history of the Hambone to Lookout line. This Reference Sheet is available through the GNRHS as part of a package also including a copy of their magazine, The Goat, Modeler's Pages, and the society's 2014 calendar.